You are invited to another 3 Valley Vegans cookery demo. Learn how to make nutritional and tasty meals for less. Enjoy taste testers throughout the evening. We will have an opportunity to share tips about eating healthily while saving money. 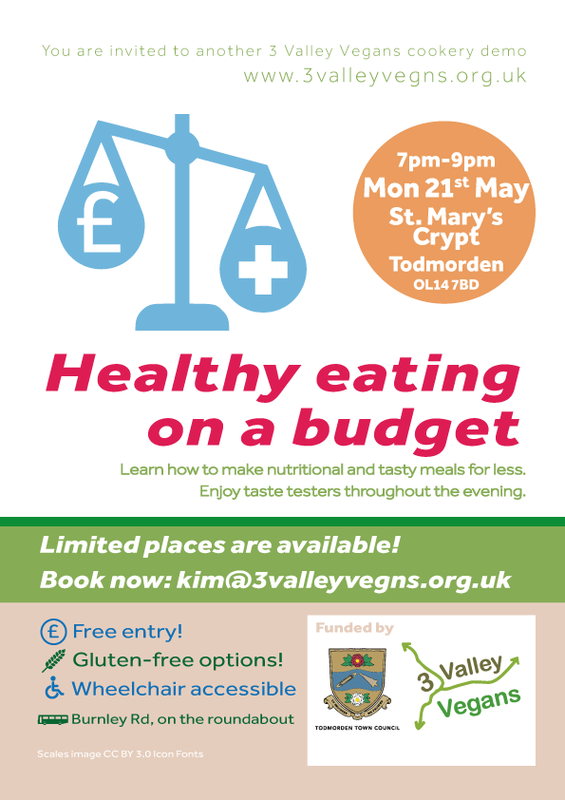 Funded by Todmorden Town Council and 3 Valley Vegans. Meet new people, learn some things and get free food; what more could you ask for from an evening out? Healthy Eating on a Budget was the first 3 Vally Vegans event I have attended and I’m happy to say I’m sure to come back again. 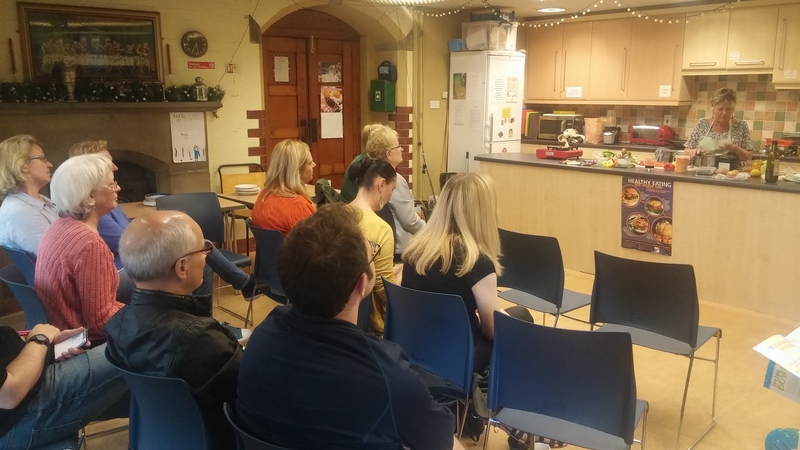 The cookery demo had a variety of interesting dishes being prepared by Hillary, Kim, Rob and Sandy with each of them sharing their own insights into how to eat healthy while not spending a fortune. The hosts presented great tasting vegan dishes such as mushroom risotto, vegetable stir fry and lentil dahl with plenty of useful hints and tips, even for those meat-eaters present who were looking to start ditching the dairy as well as helpful dietary guidance for the recently converted like myself. Even the vegan veterans in the audience got a few “I never knew that!” moments of culinary inspiration. Personally I was most tempted to try the homemade oat mylk (astonishingly easy) and frozen banana-based “nIce cream”, while other audience members were keen to start wild foraging for dandelions and lovage for their next salad. Free recipe cards and leaflets to take made it even easier to try out these new ideas at home. With a welcoming and inclusive vibe, audience participation through sharing recipe tips and a great debate on how exactly do you pronounce “tabbouleh”, this evening was fun and informative and I look forward to the next event.